I like the look of this place. And also the realism elements. Looking forward to the backstage area. There is some really amazing architecture here! I look forward to more. The presentation here is quite original! And the park looks quite nice, too! Keep on! You've got quite a lot here already for the 1st post and have set up a very interesting scenario. I tried searching for a real park of this name in Huntsville but found nothing even defunct so I'm assuming this is all a fictional story? If so, it's quite imaginative. To me, Huntsville is a space-age town. It's got both a NASA testing facility and the Army's Redstone Arsenal, after which the Redstone rocket that took the 1st Mercury astronauts to space was named. There are some excellent rocketry-related museums there. Thus, I find the Space Commander ride especially fitting for a park in Huntsville. I toast your new project here and wish you success with it! Planet Coaster Parks / Re: Coney Island 1950 - The Tornado debuts! Yep, Glevum is effectively the Roman for Gloucester, there is lots of roman history here so I thought it would be cool to put some in the park. The update made it possible to work on but still all on lowest settings. Thanks! I'd also like to credit Fisherman for 2nd opinions on the various iterations that coaster went through in development. Anyway, glad your performance has improved somewhat. But seriously, one day when you're not building, you need to cramk up the settings and really see the awesomeness you've created here. I really have to tip my top hat to you for doing such an amazing job while working essentially blind. Wow, sorry you had to rebuild stuff, but you sure did a great job! Excellent building and those vases are wonderful! I like the new picnic area! It really looks inviting with gardening and the tasteful pavilions! The gardening around the star wheel is top-shelf, too! Very glad to see you back working on this! Also glad that's a recent thing so I didn't have all that many posts to wade through. However, you've still gotten so much done in just the last month! To me, this is not only excellent art but such a history lesson. I knew nothing about Coney Island until you started this thread. Looks fantastic, CSL! I, too, like the look of those sunken awnings. So, I was 3 pages of awesome behind the times on this thread. Geez, JP, there is so much to see here. This park totally blows my mind. How you cram so much stuff into such a small space, and somehow not have it looked cramped but all fit together, so the details of 1 thing enhance those of the next, is beyond me. But you keep doing it over and over in all your parks. It's just amazing. Wow, this Harambe area is KILLER! You've certainly progressed quite far (I was like 4 pages behind) since I was last in here. Glad to see my bad advice didn't hose you up. This area is so full of magnificent stuff! You are quite justified in being proud of it all. And it looks like what I'd expect to see in Africa (never been there, just seen it on TV and flew over Egypt without stopping once). I really like the whole village, the Croc ride, and of course that excellent chairlift station! PS: Loved the video of my pagoda burning down. I hope you replaced it with something more worthy of inclusion here. Now that I'm back, this is the 1st thread I looked for, to see what you'd done with that coaster. I really like what you've done with the Roman theme. That's a nice change from what you usually see for a woodie and it works quite well. The whole villa next door is also amazingly beautiful and quite realistic. "Glevum" is the Roman name for Gloucester, right? Nice touch. I'm sorry that your FPS is so low that it prevents you from seeing just how gorgeous this park is. It was running pretty good for me when I was building the coaster and the level of detail is stunning. I hope the recent update improved things for you, so you can turn up your graphics settings. Do I have your permission to release the coaster on the Workshop now? I think it's one of my best and would like to make it available to the world. I haven't done so yet because I wanted you to be able to reveal it here first. @ Bullethead: So real, that it hurts...love the water tower at the horizon. Bullethead - nice work (was going to say "dam" that's nice). Pipes look great sending water off the side. Thanks but it still needs some work. 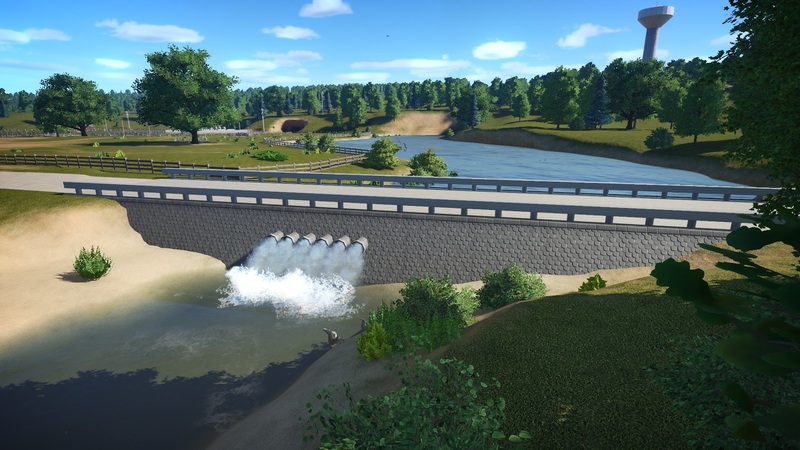 Here you see the dam able to handle the 2 extremes, the normal flow before it was built (the existing pipes and SFX) and an extraordinary rain event (the water flowing over the top through the guardrails). It still needs something to handle the middle ground, the expected occasional flash flood that doesn't overtop the dam. Probably just some more pipes higher up and as wide as the whole downstream channel. Holy cow, Neitsab, that's some very nifty nested loops there! It definitely ain't easy to get track elements to line up that well when you have to build from 1 end of the track. I've staggered back in here and had to look at the 2.5 pages of awesomeness that have accumulated during my recent absence. Wow, kudos to everybody! But top honors IMHO go to BBordewyk's showering archer for combining the usual SGW standards of technical brilliance with insider humor. So yeah, here I am again to lower SGW's standards even more. I present this humble offering. It's merely a simple dam over the headwaters of the Little Chunky River in an obscure part of Mississippi but getting this far with it marks a Pyrrhic victory in the unending war with the never-to-be-sufficiently-damned water part of PC's terrain system. Thanks for collecting all this information! Even if I think I'm too lazy to stick to all this stuff, especially the logflume-wastewater conditions. My Water won't get dirty, that's my solution. Period. I love this! Thank you for the real world application, this could be used in all of our creations to make us all even more confused on what is real and what is in-game! Thanks, folks! I'll try to get NFPA 101 up eventually, although it will likely have to be done in pieces. @Lux: Thank you very much! But personally, I think the atmosphere smells of cow pasture . But where I come from, a bucket on a jointed arm is called a man lift. A cherry picker crane is a telescoping, not jointed, boom, and it ends in a pulley to lift things (because it's a crane) . Also be sure that you're using an UN-lit billboard. Many of them (all the screens) are lit, meaning they have an internal light that shines out through your image. By 'unique', I mean different, imaginative, and always entertaining. Very cool park! I see you labeled my lamp post, I was confused for a second why my name was in one of your screenshots. It's my habit and custom to put signs on or near the Workshop items I use, to give credit to the authors. As you have so many excellent lights and as I plan on using quite a few of them, I thought it best to give you credit up front . BTW, do you like the acronym 'BALLS" for your various light packs? That's a tease alright Looks great! I always love your parks. They're always so unique and there's always a nice bit of humor thrown in to boot.